Please note that tickets for both sets of supporters will be available on the day of the match right through to kick-off, subject to availability. Cardiff were allocated 4,000 tickets but sales have peaked at around 2,400 which is still good going for a 1st leg match in a location that's awkward to get and from and that's live on TV. 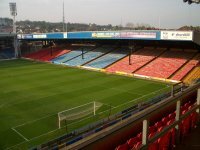 Palace have re-allocated a section of the initially allocated away section back to home fans.